Crime is an inevitable part of any functioning society -- our goal is to monitor and predict it. 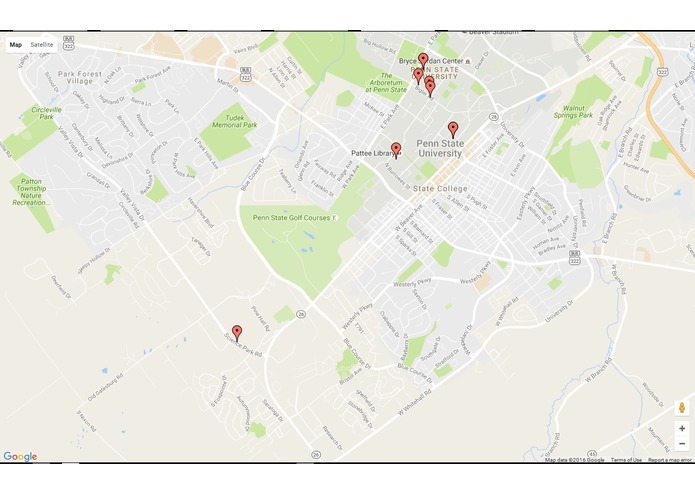 The first step to this problem is by making it apparent to the masses, so we created an easy and accessible way to see crime activity at Penn State. 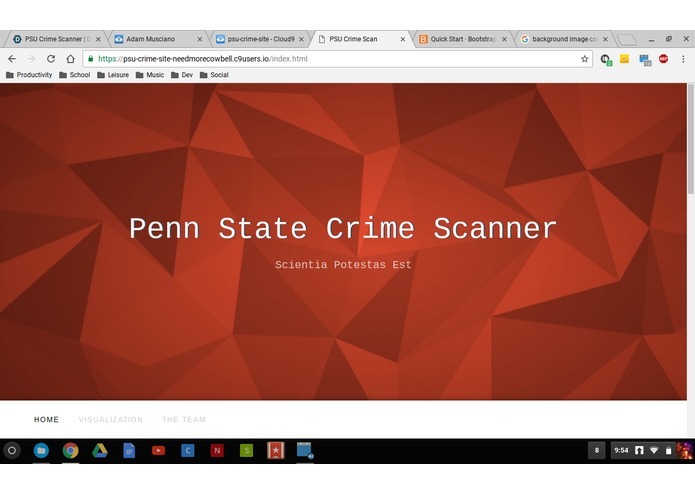 This project scrapes the Penn State Daily Incident Log, then stores the data to be visualized. In the map visualization, there are markers laid out that show where crimes happen, what status crimes are in, and the type of crime it is categorized as. Other visualizations provide ways to improve and add artistic diversity to our original idea. We scraped the Penn State website in python, using beautifulsoup to parse the data. Then, we store that data in a mysql database to log the crimes for visualization, RESTful API calls, and possibly machine learning. The data is visualized on a map in bootstrap website. There is another page for more artistic representations of the data, which we created the RESTful API for to hopefully encourage other developers to contribute visualizations and new patterns for the community. The data was very unorganized coming into this. Our biggest issue was irregular data that needed to be translated. At first we had tried natural language processing to merge similar categories, but our efforts didn't yield any results. Clustering using the google maps api was a challenge for us, but we decided it would be best to create our own solution that used individual markers instead. Our team worked hard to practice what we didn't know. If a team member needed to learn a language or concept, they were put on that task, and the other teammates helped to constructively teach each other. We learned as a group, and produced a humanitarian product that we are all proud of. We learned how important a schedule is. If we would have had a structured schedule, the project would have had many less bumps in the road. Machine Learning and Community Involvement! If enough people came up with cool ideas, and enough data sets were gathered, this project has the capability of predicting where crimes are likely to happen and what time they are most likely to happen.